Audio books were something I never gave a lot of thought to. Oh, I'd listened to one or two over the years, but I always preferred to read a book. That has started to change over last year. I can't really pinpoint a single event, but I would say the amount of traveling I've been doing had something to do with this change. Anyway, sometime last year I started listening to audio books in the car. Then I brought them inside and started listening to them while I cooked, or made buttons, or any task that took both my hands but not my full attention. Now I wouldn't say I'd rather listen to a book over read it, but I definitely enjoy being able to multi-task. Today I'm being interviewed over at My Bookish Ways Blog. There is a giveaway for Grave Witch, so if you haven't heard me talk about myself and my books enough yet, please go check it out! Do you remember last week's post about the Facebook Author Page Contest? Well, the contest has now ended and it's time to draw the winner! Congratulations Lisa! Please send an email on facebook or to contests(AT)kalayna(DOT)com with which book you'd like to receive and where you'd like me to ship it. Thank you everyone who "liked" the new author page. Stay tuned for more contests and book info to come. New Widget and a link to "The Preposition Gnome"
Hey everyone. This is a just a quick post to let everyone know I'm over at Magical Words today. I wrote a craft post about the preposition gnome haunting my laptop, so I hope you'll head over and check it out. In other news, I designed a countdown widget for the release of GRAVE DANCE. If anyone is interested in sporting the widget on their page/blog/what-have-you, just click on the grey "Get Widget" box under the counter for the code. I mentioned last week that I was planning a contest for those who "liked" my new author page on Facebook, and I am now ready to get that contest going. Entering is super easy: everyone who currently "likes" the page as well as all those who join by 11:59 pm on Tuesday, March 22nd will automatically be entered to win. Now I'm sure you're all wondering what you could win, right? I'm glad you asked. Today I'm very pleased to share the first sneak peek excerpt of GRAVE DANCE! If you'd like to check it out, you can CLICK HERE. This first excerpt is only a few pages long, but check back often because I'll be releasing extended excerpts on or around the 15th of each month between now and the book's release in July. I hope you enjoy and thanks for reading! Hey everyone. I'm very pleased to share a quick author chat with New York Times Bestselling urban fantasy author, Faith Hunter. I had a chance to chat with Faith about her books and tips for writers when I was at StellarCon last weekend, so I hope you'll check out the video (below). And for more writing tips, be sure you check out www.magicalwords.net. First and foremost, I want to thank all of you who have joined the fan page on facebook. Next week there will be a contest that everyone who likes the page will be automatically entered in, so watch this space for more information to come. 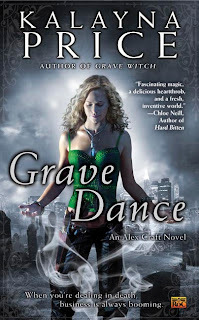 Next on the list, I'm very excited to announce that GRAVE WITCH was nominated as "Best Novel with Romantic Elements" for 2010 by The Romance Reviews. If you have a moment, I'd be absolutely thrilled if you'd head over and vote. Thanks! Now, when you were watching that interview, did you hear how Misty described her book, Mad Kestrel? She didn't give us a big break down of the plot or give us a long explanation about who her main character is. She gave us just two short sentences: "A rollicking adventure of magic on the high seas. If Jack Sparrow had a little sister, it would be Kestrel." Hey everyone. I'm back from StellarCon and I have a sack of updates to share with you, but I think I'll have to spread them out across the week. For today I just want to direct your attention to my brand new fan page over on Facebook. Please take a second to check it out and "Like" it if you're a facebook user. I'm still getting information up on the page and working out the kinks, but my hope that it will not only be a great place to find out what is happening with me but also to connect with other urban fantasy and paranormal romance readers. I've added a discussion board to the page, so we will see what happens. This is a flash post because I'm due down at the signing table in 20 minutes. I just wanted to say a big thank you to everyone who have me advice and encouragement for my first ever public reading. I recorded it, and I think it wasn't a total disaster. And now for your enjoyment, if you missed the reading in person, you can watch the clip now. I'm having a great time at StellarCon and I promise a full update once I get back. Have a great weekend everyone. It's Thursday, which means tomorrow I head to StellarCon in Highpoint NC and at 4:30pm I have my first ever reading. I'm at 28 hours until the reading and I still don't have a clue what passage I'm going to read. I don't even know how long a passage I should pick. I wish I had attended more readings in the past, but I haven't, so I'm flying rather blind. I just had a long talk with fellow author Rachel Aaron, and she pointed out that if you can't do voices, dialogue tends to run together so avoid dialogue heavy scenes. I'd never considered that. The block for my reading is 30 minutes, but I doubt anyone would like to hear me drone on that long. It would probably be best to split things up and pick a 10 minute passage, talk a bit and get a feel for what the attendees (if there are any and I'm not reading to an empty room!) are interested in, and then read a shorter second passage based on them. What do you think?